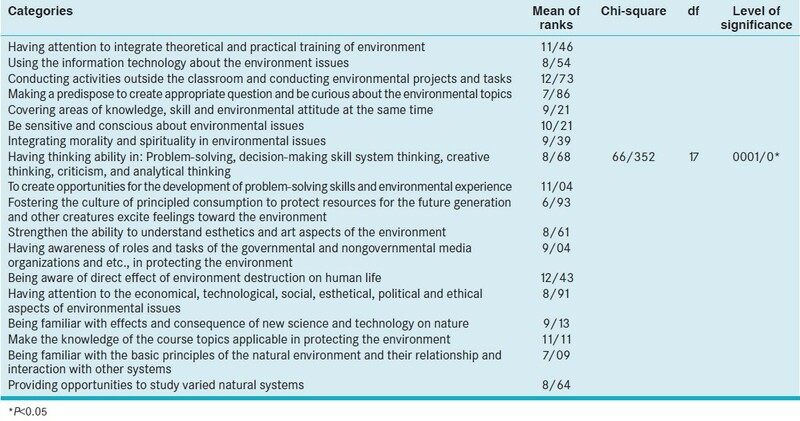 Aim: This study was aimed to design environmental literacy curriculum for secondary school education system in Iran using an integrated approach. Methods: This study is a quantitative type. Theory basis, former resources, and environmental literacy component were extracted from theoretical resources and research background using a descriptive narrative overview, and then the proposed environmental literacy training framework study were classified as four elements (purpose, content, methods of teaching-learning and evaluation) that consists of three components of knowledge, skills, and attitude to the environment. Result: Data were presented to environmental experts and curriculum developers. Kolmogorov-Smirnov single group test, binomial distribution test, single group t-test, and Friedman test with SPSS software (version 20) were used for analysis purposes. Binomial distribution and t-test results (P ≤ 0.05) represent the item's importance in the views of the participants. 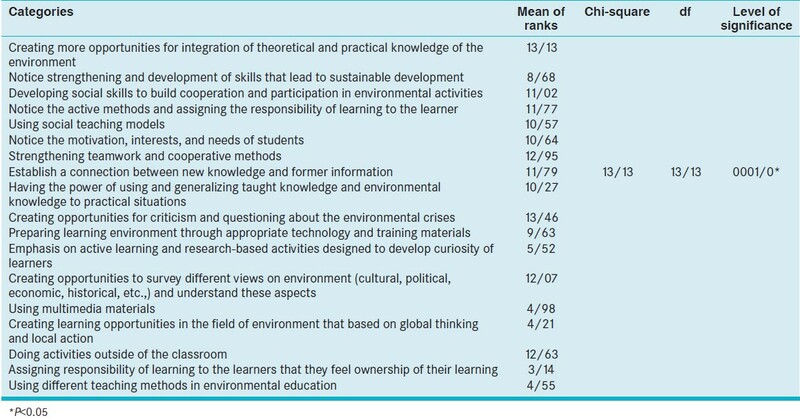 Conclusion: The findings show that develop the four basic elements of the curriculum based on the integrated approach, based on three main components of the knowledge, skills, and attitude, facilitate environmental literacy in high school students. In this context, it can be a combination of objectives, content, teaching methods, and evaluation are applying. Environmental literacy Integrated method proposed in this research is cross disciplinarily. The evidences show that the environmental crisis is one of the most important contemporary issues. This is an issue that has emphasized in Agenda 21 and the Rio + 20. Integrated Approach; a Suitable Approach for Designing and Developing an Environmental Literacy Curriculum in Higher Education System International Journal of Psychology and Behavioral Research International Journal of Psychology and Behavioral Research 2013;2:315-324. There is still considerable ignorance in this matter especially in developing countries that public do not have enough sensitivity and motivation about environmental issues and sustainable development. What the human do about his ecology depends on how he thinks about his environment. According to the researchers, a lack of environmental awareness is the critical element that leads to environmental destruction,  and training is the best tool for facing the future environment challenges. Training responsible citizen equipped with knowledge in the field of environment  and being able to resolve environmental issues and have motivation to actualize the strategies , (is quoted by Soleimanpour Omran, 2013) are the issues that if they do not be evaluated and formalized then environmental education will not become serious. Therefore, schools are the first and the best platform for targeted training of environmental concepts and promoting environmental culture. Hence, the importance of environmental curriculum can be outlined as follows: (1) Resources scarcity and environmental crisis. (2) Develop a culture of success desire and maximizing profits (3) the nature of ability to communicate with various issues (4) requires citizens with environmental literacy for the implementation of environmental legislation  and contribution of youth that make up 30% of the population. Integrating curriculum means the combination of content areas or study subjects that are included in school's curriculum of traditional educational system separately. Studies show that a separate curriculum provides environmental knowledge superficially and does not cover the depth. Although secondary school has more potential for using the opportunity of environmental education but this needs more effective program  Secondary school's students shall soon be in the process of deciding future of the country as a citizen and enter the stage of employment. With increasing their mental capacity to understand the issues and also developing their abstract thinking, the students require a practical approach to dealing with a new, more serious and deeper issues of environment. In addition, through changes in environmental attitude, willingness to pay a fee for environment protection should be important. For the present, environmental education does not have principled planning, continuance, consistency, enough cohesion and appropriate standards and also cannot respond needs for mental development, demands, and interests of young population. These results also have been achieved in similar studies by others: Tourany and Keramodiny  Hosseini et al. ;  Rafiee and Amirnejad;  Mirdamadi et al. ;  Ferdowsi, et al.,;  Moharamnezhad;  Tourany and Keramodiny;  Dibaee and Lahijanyan. Yaghoubi et al. in a research entitled "evaluating reflection of issues related to natural resource in textbooks" showed that in environmental education the emphasis is on memorizing instead of understanding and actualizing. Grice  in his study entitled "Integrated Curriculum for Ontario Secondary School's" aims to introduce environmental integrated curriculum for high schools. Grice showed that knowledge is often divided into specialized and separated units in high schools and rarely gives the student an overview of the world around them. 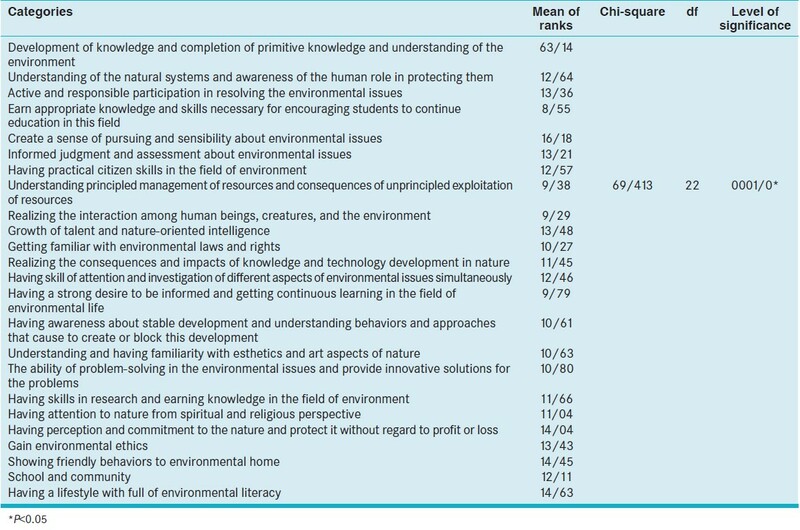 Researches of Haza et al.,  Prayoon and Prasart,  Mat et al.,  Erdogan et al.,  Srbinovskia  in the field of environmental literacy education and integrated curriculum showed that a balanced training of three components of knowledge, skills, and attitude for the environmental education shall be effective specially as an integrated curriculum. Therefore, the school and educational system where formal educational inputs are received by the student, have a major and critical role to play in the environmental educational process of the next generation that has to live into the future. We can classify conducted studies in three general categories: (1) The first category are studies in the field of environmental curriculum that analyzed only content or evaluate requirements. These studies did not mention to the problem of curriculum designing and organizing content of such education or a thematic view instead of an integrated vision. This group encompasses a large part of the internal investigation. (2) The second group in the field of environment just mentioned integrated curriculum, and they did not present any model or framework. (3) The third category has been mentioned integrated approach and attempted to present a theoretical model and framework. In general, in most researches of environmental education, there has been not enough attention to integration approaches, providing appropriate and operational frameworks for environmental literacy curriculum. Therefore, the advantage of this study compared with studies conducted in Iran can be determined because of introducing environmental literacy and defining curriculum components in secondary school and finally presenting a proposed model for designing integrated environmental literacy curriculum. Accordingly, this study is about to answer the following questions: What are the proposed objectives of environmental literacy curriculum for secondary school using an integrated approach? What is the proposed content of environmental literacy curriculum for secondary school using an integrated approach? What are the proposed teaching and learning methods of environmental literacy curriculum for secondary school using an integrated approach? What is the proposed evaluation method of environmental literacy curriculum for secondary school using an integrated approach? Descriptive method with the narrative overview of the theoretical resources and research background were used to identify and extract the environmental literacy components. Statistical universe consisted of 30 subject specialists and faculty in the field of curriculum and environment selected purposefully from the country's universities. To seek the opinion of experts about reliability of the basic framework, we used descriptive-survey by distributing the questionnaire. Content validity was confirmed by expert's opinions. Cronbach alpha coefficient was calculated to be 0.92. Friedman test was used to assess the questions related to priority ordering of categories. Binomial test was used to assess the importance of the categories and one-group t-test was used to assess the importance of each variable. To validate the proposed framework, Experts' opinions were collected as questionnaire consisted of 77 categories that rate the importance of each "option" concerning the main components based on Likert five grade scale (from Seldom '1' to High '5'). Data analysis was done using SPSS statistical software (IBM Company, New York, USA). Research findings consisted of categories, rating average, Chi-square, and significance level. The first question : what are the proposed objectives of environmental literacy curriculum for secondary school using an integrated approach? [Table 1]. The second question : what is the proposed content of environmental literacy curriculum for secondary school using an integrated approach? [Table 2]. The third question : what are the proposed teaching and learning methods of environmental literacy curriculum for secondary school using an integrated approach? [Table 3]. The third question: What are the proposed evaluation methods of environmental literacy curriculum for secondary school using an integrated approach? [Table 4]. Environmental literacy is interdisciplinary and holistic, environment issues are multidimensional and teaching it is integrated from several fields of cognition. Therefore, in order to change values, attitudes, and environmental behavior, it is necessary to pay attention to emotions. Environmental education methods should be seriously reconsidered, and the theory of social learning can be a solution for environmental education. Organizing environmental literacy curriculum uses three main items of knowledge, skills, and attitudes with an integration approach that leads to achieve environmental literacy in form of environmental science, practical ethics, familiarity with the valued and cultural concepts of environment, changing attitudes toward it, participate in protection of environment, have awareness of using resources appropriately, achieve a lifestyle compatible with environment, make accurate decision for solving environmental issues and having sensitivity about it, have the power to identify and analyze environmental issues and invent new methods to solve the problems. The results illustrate the importance of creating sensitivity and sense of pursuing about environmental issues selected as the highest goal, doing out of class activities and projects and environmental duties selected as the best content, creating opportunity for criticizing and questioning about environmental crisis selected as the best way, performing tests to check proficiency of learners on cognitive and scientific content of environment were selected as the best methods among subjects. In this context, Grice,  Jekaynfa and Yusuf,  Abdullah et al.,  Prayoon and Prasart,  Littledyke  also pointed out integrated curriculum as an appropriate approach to codify the environmental curriculum. In choosing components and main concepts for the purposes and content of environmental literacy curriculum, we should notice needs assessment, harmonizing and also content and topic changes of books in secondary schools. Current fragmented education has a mental aspect and uses traditional methods about content, method, and assessment. In traditional methods, needs, experiences, and interests of students have not been included. These issues have also stated in researches of Yaghoubi et al.,  Turanian and Keramaldini,  Dibaee and Lahijanyan,  Hosseini et al. Learning is a general matter and cannot be divided into individual components in a linear structure. Environment included in soft sciences and has the ability to integrate. All the researches show that in most environmental education research, providing appropriate and practical framework for environmental education and appropriate approaches and models for environmental education has been neglected. This is particularly highlighted in environmental education researches of Iran that these researches approaches are mostly limited to theoretical and descriptive studies and content analysis. They are just comparing three domains of cognition, value and skill in the context of textbooks and they are not intended to provide a model or theory of expansion and strengthening of environmental literacy or methods and practical teaching strategies, organizing  the development of attitudes and values cannot be based on the superficial programs and a systematic attitude should be employed in this context which including the use of awareness raising indicators along with variation of intrinsic ethical motivations that comes from human's unconscious mind and in addition to education and transfer of awareness should take advantage of the change in environmental attitudes and value in the form of formal and informal training. It is interdisciplinary and requires interdisciplinary and flexible curriculum. Undoubtedly, having benefit from the scientific findings and capacity of other fields and looking them from different aspects can provide a more comprehensive understanding which requires simultaneous attention to three components of knowledge, values, and attitudes on environmental education and also requires deep connection with other subjects which leads to more effective and easier teaching. Due to lack of consideration about integration approach and also aggregation and extreme amount of environmental information in one subject, and also content poverty in others subjects are the disadvantages of current educational system. Although most teachers confirmed the necessity of integration approach and using interdisciplinary methods but lack of basic knowledge and experience in this field, it should be difficult in the implementation stage. According with course objectives, secondary schools have been more separated and more specialized and have less flexibility in contrast with lower levels. Due to the nature of high school subjects which are apart from each other and have less ability to integrate the lessons and the needs of developing separate curriculum for environmental education causes the courses volume to increase and make it optional and ignorable. Integrated method proposed in this research is "cross disciplinarily" that includes the investigation and study of a phenomenon or scientific issues related to a specific field using the principles, experiences, and methodic skills of a scientific course or of other researches and injecting environmental concepts in other subjects. This method increases the chance and possibility of implementation and usage through limitation of using different integration models in thematic educational and discipline-based systems. Omran MS, Yarmohammadian MH, Keshtiaray N. Integrated approach: A suitable approach for designing and developing an environmental literacy curriculum in higher education system. Int J Psychol Behav Res 2013;2:315-24. Agenda 21. United Nations Conference on Environment and Development. (H. Refreshing, A. Ayft, Trans. 1998) Tehran: Environmental Conservation Organization Press. (Original Work Published 1992); 2008. Abedi SA, Shah WM. Necessity and characteristics of research in environmental ethics. Q Ethics Sci Technol 2008;3:56-61. Waktola DK. Challenges and opportunities in mainstreaming environmental education into the curricula of teachers colleges in Ethiopia. Environ Educ Res 2009;5:589-605. Mirdamadi M, Esmaeili S, Varkaneh AA. Study of high school students′ interesting relation to environmental protection. Environ Sci J 2008;46:21-39. Daskolia M, Agelidou E. Kindergarten teachers′ conceptions of environmental education. Early Child Educ J 2005;3:19-22. Alvarez S, Vega Marcote P. Developing sustainable environmental behavior in secondary education students (12-16) analysis of a didactic strategy. Procedica Soc Behav Sci 2010;2:3568-74. Cridel K. Encyclopedia of Curriculum Studies. Vol. 1. university of South California, Sage Publication; 2010. p. 1-10. Shayan S, Formal environmental education in the geography curriculum of guidance and secondary schools in Iran. Mag Geogr Teach Growth 2004;65:9-3. Mohammadi AM, Mohammadi AA. Review on environmental ethics. Papers of first conference of planning engineering and managing environment systems. Environ Coll Tehran Univ 2004;4:712-24. Taghie N, Qaltash A, Falah V. Citizenship training and environmental education. Papers of the conference on Educating Citizenship. Marvdasht Branch Azad Univ 2010;18:150-64. Mehrmohamadi M, Ahmadi P. Integrated curriculum, a different approaches to subject oriented curriculum discipline based (the traditional method). Q Humanit Alzahra Univ 2001;39:199-217. Sharina Syed Abdullah Sh.I, Halim L, Edy Hafizan MS. Integration of environmental knowledge across biology, physics and chemistry subject at secondary school level in Malaysia. Procedica Soc Behav Sci 2011;15:1024-8. Schweitzer A. Animality and environmental education: Toward an interspecies paradigm. Nobel peace prize address. Can J Environ Educ 2011;16:8-13. Tourany H, Keramodiny M. Status of environmental education in the formal system of education. J Iran Dep Environ 2004;41:86-80. Haj Hosseini H, Shobbeiri M, Farajollahi M. Needs assessment and determine educational priorities among secondary school students in the field of environment and sustainable development. J Sci Res, Environ Sci Technol 2010;5:179-94. Rafiee H, Amirnejad H. Checking role of education in creasing people′s tendency in protecting. Environ Environ Sci 2009;1:108-95. Ferdowsi S, Mortazavi SH, Rezvani N. The relation between environmental science and environmental protection behaviors. Humanit Bull 2007;53:253-66. Moharamnezhad N. Codify management template for a constant development of environment for young population. J Sci Technol Environ 2006;28:68-77. Dibaee SH, Lahijanyan A. Reviews guidance school curriculum with emphasis environmental education. J Environ Sci 2009;3:177-84. Yaghoubi J, Mirzaei A, Dehkordi AK. Evaluation of natural resources issues reflected in the textbooks on primary, middle and secondary school. J Forest Pasturage 2003;3:35-37. Grice J. Curriculum integration in ontario high schools. Pathw Ont J Outdoor Educ 2011;1:4-8. Al Fowehi Hazaa AK, Osman TK, Mohd MS. 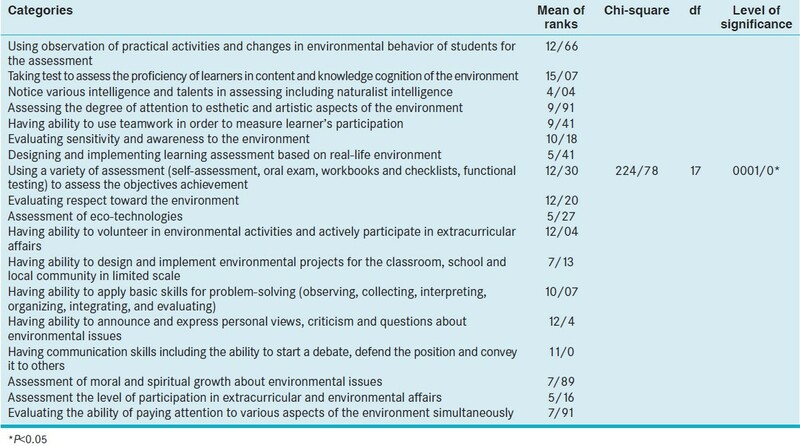 The impact of module based curriculum and extra-curriculum activities′ in developing environmental skills among saudi′s. Secondary students. Procedia Soc Behav Sci 2011;15:1756-60. Prayoon W, Prasart N. Effects of environmental ethics infusion instruction on knowledge and ethics of undergraduate students. Res J Environ Sci 2011;5:77-81. Mat SA, Nurizan Y, Fakhrul-Razi A. Environmental comprehension and participation of Malaysian secondary school students. Environ Educ Res 2007;13:17-31. Erdogan M, Bahar M, Usak M. Environmental education in high school 9 th -12 th biology course curricula started to be implemented in 2007. Educ Sci Theory Pract 2012;3:2230-5. Srbinovskia M, Erdogan M, Ismailia M. Environmental literacy in thescience education curriculum in Macedonia and Turkey. Procedia Soc Behav Sci 2010;2:4528-32. Gopinath G. A study on the environmental awareness among secondary school students in a district of Kerala state. Int J Educ Psychol Res (IJEPR) 2014;3:2. Jekaynfa AA, Yusuf AR. Teachers opinions on the infusion of environmental education in the Nigerian primary school curriculum. Kenya: Department of Arts and Social Sciences Education, Moi University; 2005. p. 250. Littledyke M. Science education for environmental awareness: Approaches to integrating cognitive and affective domains. Environ Educ Res 2008;1:1-17. Omran MS. Synthesis based researches (Integrative Inquiry) of environmental education in terms of attention to the integrated and interdisciplinary curriculum. J Middle East Appl Sci Technol 2014;14:636-41.